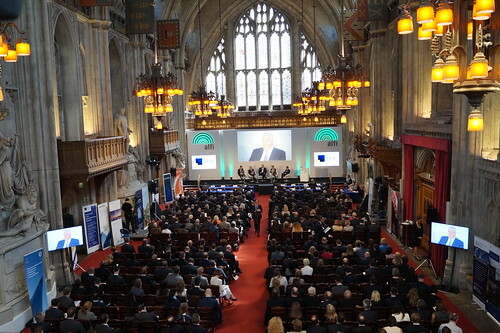 Over 1 200 fund industry experts registered for the 2016 edition of the ALFI London conference! Benefit from numerous networking opportunities with top representatives all gathered in one place and use the opportunity to engage with the ALFI community representing the second largest investment fund domicile in the world. For the first time, ALFI is offering the opportunity to non-members to have an exhibition stand (3mx2m) at the cocktail and the conference in the spacious catering and networking area. See sponsorship & exhibition section. Have a look at last year's edition by clicking on the photo below! View the full list of speakers here! Online registration is now closed but you are welcome to regsiter oniste. Just bring along your business card! Last year's event attracted 30 sponsors, don't miss this opportunity to enhance your company’s brand recognition by showcasing your business, skills, products and services to the whole fund industry community gathered in one place! Sponsorship opportunities available for ALFI members! Please contact us at events@alfi.lu for more details. For the first time, ALFI is offering the opportunity to non-members to have an exhibition stand (3mx2m) at the cocktail and the conference in the spacious catering and networking area. Only a few spaces available that will be sold on a first-come-first-served basis. Click here for the details and agreement form. Please note that there is a very limited number of press passes available and in any case, we can only offer ONE free press pass per newspaper or magazine (subject to approval). Once we have reached the limit, we are unable to offer any further press passes. The press passes are exclusively reserved to journalists covering the conference. We are unable to offer press passes to advertising managers or administrative staff of any publication. Filming and taking photos at the conference, either in the auditorium or at the conference venue, require preliminary authorisation from the ALFI press office. Kindly refer to the Media Partnership section below to learn more or contact the ALFI press office. Should you wish to set up an interview with any of the ALFI representatives or event’s speakers, please contact the press office (communications@alfi.lu) mentioning details of your request (your name, media organisation, date, time, and subject of your interview, etc.). Distribution of 50 copies of your publication at the conference press desk and display of your logo on the conference’s website will be allowed under the condition that the concerned magazines/newspapers run an appropriate announcement of the conference free of charge prior to the event. The copies to be distributed are provided by the publisher free of charge for ALFI and send directly to the conference venue. To conclude this agreement please fill in the media partnership form and return it by mail to: communications@alfi.lu.